How can I manage my library account? What if I bring my books back late? I can't return my book in person. Can I post it back? How do I use the printing and scanning facilities? What online resources does the library provide access to? How do ​I register for an ELHT Open Athens account? I have forgotten my Open Athens password. How do I search for a journal? I can't find the journal article that I need. ​How do I request an evidence search? All staff of East Lancashire Hospitals NHS Trust and students on placement within the Trust can register to use the library. All staff who are employed by ELHT or PWE Healthcare, or are employed by Lancashire Care and are based at either Royal Blackburn Teaching Hospital or Burnley General Teaching Hospital or are students on placement within the Trust can register to use the library. An external membership scheme is available to health or social care staff who do not have an existing service level or reciprocal agreement for the provision of library services (qualified GPs, CCG staff, hospice staff). Please contact the library for details. 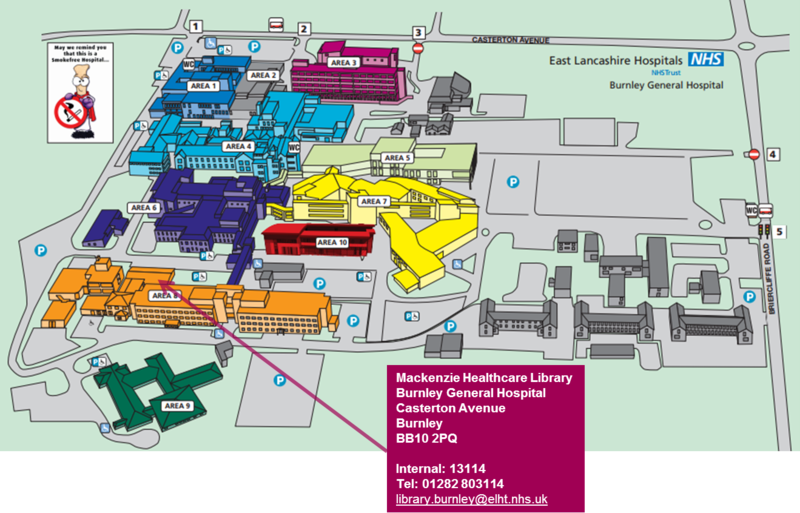 Library services are delivered on both the Blackburn and Burnley sites. To register call into one of the libraries or complete the online form. 24 hour access to the library is available to all registered users of the library. Please ask library staff. ​How do I find the books I need? ​​How many items can I borrow at one time? You can borrow up to 12 items at any one time. ​How long can I borrow books for? ​How can I manage my library account? Find out here how to mange your library account. The maximum fine is set at £5.00 per item. We can accept cash, card or cheque payment. If your books become very overdue (over 60 working days) you will be sent an invoice for replacement costs. ​I can't return my book in person. Can I post it back? If you are unable to return a book in person they may be returned in the Trust internal mail system or in the post. If posting we recommend that you obtain a proof of posting receipt. Please allow postage time if you are going to post your items back you as fines will incur for late returns. Printing is monitored by I.T. Dept. PLEASE NOTE THAT ACCESS IS FREE BUT IS ONLY FOR 2 WEEKS AT A TIME. USERS WILL HAVE TO RE-REGISTER AFTER EACH 2 WEEK PERIOD. A wide range of online resources are available to you. These include ejournals, databases (e.g. Medline, Cinahl), point-of-care tool (UpToDate and BMJ Best Practice), an online 3D human anatomy education resource (AnatomyTV), and Oxford Medicine Online. In order to access online resources you will need an NHS OpenAthens account. How do I register for an ELHT Open Athens account? You can reset it online. ​To reset your password simply enter your OpenAthens username and the email address you used to register the account in the boxes provided. You will then receive an email with a link to reset your password. Go to NICE A-Z Journals. To see all the journals that you are entitled to access - including those purchased regionally and locally - you need to login with an ELHT Open Athens account. If you do not have an account, you may register for an OpenAthens account here. ​Where can I search for articles? Go to Healthcare Databases Advanced Search and log in with your ELHT Open Athens account. Journal articles that are not available through ELHT library resources can be requested at a charge of £3.00 via our online article request form. ​Find out about our evidence searching service and complete the request form.